Patches, Bailey, Gucci, Ginger, and Sadie were pulled from the city shelter (BARC) on the day they were scheduled to be euthanized. They are the most adorable babies on the planet, and just need good homes to be loved in for life! They are 16 weeks now and ready for adoption. 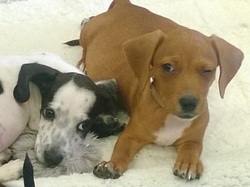 Spay and neutyer surgery is covered with their adoption fee!